April 2, 2018 Michal B. Getting a reliable, cheap taxi in Prague may be a struggle, but luckily Uber works perfectly in Prague and is by far the most recommended option to travel here. So far, Prague is the only city in the Czech Republic where Uber is available, but hopefully, other popular cities like Brno, Ostrava, Cesky Krumlov and Ceske Budejovice will soon follow. AIRPORT TRANSFER To get from the Prague Airport to the city center we recommend using Welcome Pickups service which offers far better quality and reliability than Uber. For the same price as a regular taxi or Uber (22€), you will get a private driver with excellent English and knowledge of Prague. The driver will be also waiting for you with the welcome sign at the terminal exit. FREE RIDE Save even more with our unique promo code “PRAGUEGO” and get 100 CZK ($5.00) off from your first ride. Alternatively, register using the button below. In case you are unfamiliar with Uber’s services, it’s an extremely easy way to travel, available almost in every country in the world. You can simply download the app onto your Android or iPhone, enter your Credit/Debit Card details (no need for cash) and book your own driver. It’s perfect for short city distances up to about 20 kilometers. Also, most of the drivers in Prague understand at least basic English, so you don’t need to worry about any language barrier. 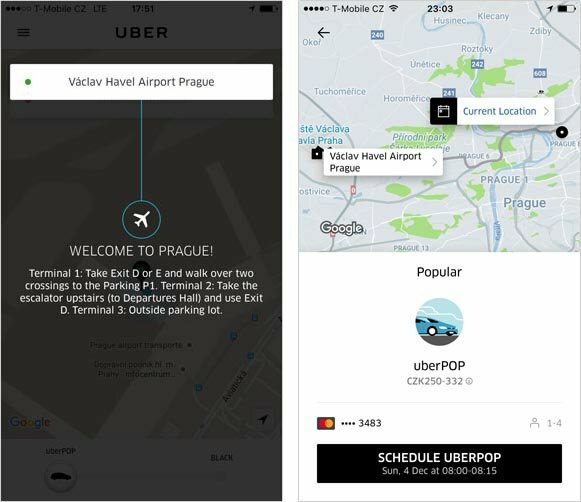 In Prague, you can choose between UberPOP (same as UberX), UberSelect, and UberBlack. The first one is the cheapest option and gives you a random car of any class. It’s officially a ride-sharing service, so it’s not regulated in any way. UberPOP is practically the same as UberX in other countries, the difference being that UberPOP drivers are not allowed to make a profit, only share the ride. With UberBlack you will get a professional driver with a luxury car, typically a black Mercedes-Benz E-Class. UberSelect is somewhere in between these two. For costs approximately 30% higher than UberPOP, you will get a more comfortable car (Skoda Octavia, Volkswagen Passat, Ford Mondeo) which is brand new (or almost new). Also, the drivers of UberSelect have higher ratings and know Prague’s routes much better. Uber officially started in Prague (and the Czech Republic) on 13 August 2014. At first, the only available service was UberBlack, but a few months later, in November 2014, the popular UberPOP became available. In November 2016, UberSelect became the latest addition to Uber Prague’s fleet. All modes are now approved by the local government and authorities. Compared to regular taxis, Uber is extremely cheap in Prague, especially for shorter distances, as the average taxi rate here is 24 CZK ($1.00) per kilometer. 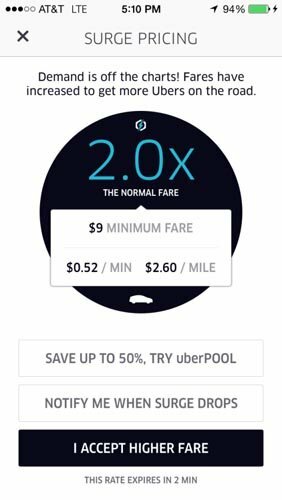 In August 2016, Uber reduced its fares for UberPOP by approximately 15%. Check the table below for the rate comparison and an example calculation for Prague Airport to downtown (Wenceslas Square or Old Town Square). OUR TIP To get from the Prague Airport to the city center we recommend using Welcome Pickups service which offers far better quality and reliability than Uber. For the same price as a regular taxi or Uber (22€), you will get a private driver with excellent English and knowledge of Prague. The driver will be also waiting for you with the welcome sign at the terminal exit. To calculate the estimated rates for your ride with Uber in Prague, you can use the Uber app, the Uber Prague official site, or our own calculator below (don’t forget to specify Taxi Type: UberPOP, Uber Select or UberBLACK). As in every other city where Uber operates, also in Prague, there are so-called rush hours when the demand is high and Uber pricing is increasing. It usually by 1.5 to 2.5 times of the regular price. So if you are paying 10 CZK per kilometer and 3 CZK per minute as standard price and surge 2x applies you will be paying 20 CZK per kilometer and 6 CZK per minute. Uber also works perfectly as a means of transport from/to Vaclav Havel Airport Prague; simply open the app and call yourself a car. If you arrive at Terminal 1, take the Exit D or E and walk over two crossings to Parking Area P1. From Terminal 2, take the escalator upstairs to the Departures Hall and use Exit D.
Since there is no official Uber meeting point or parking zone at Prague Airport, you may be waiting for your car to arrive for quite some time, depending on how close it is and the traffic situation. In general, the waiting time is around 10 minutes, but during rush hours it could be as long as 30 minutes. The ride from the airport to downtown (Wenceslas Square or Old Town Square) will cost from 300 CZK ($12.00), depending on traffic. Still, it’s one of the best options to get from and to the airport. Below is the Uber “Welcome to Prague!” screen with detailed instructions. You should see this when you open the app at Prague Airport. Getting from Prague city center to the airport is extremely easy. You just request or book an Uber upfront (like on the image above) using the mobile application, and type “airport” into the destination field. It should automatically suggest “Vaclav Havel Airport“, the full name of Prague’s airport. Before you arrive at the airport, just tell the driver which terminal you’ll be at – Terminal 1 is for flights outside the Schengen area and Terminal 2 is for flights within the Schengen area (typically the European Union). And don’t worry – Uber drivers are available all day and night, so even if your flight is early in the morning you shouldn’t have a problem getting a car. Nevertheless, we definitely recommend booking it upfront. 5. Uber Prague Safety – Is it Safe to Use Uber in Prague? Don’t worry, it’s totally safe to use Uber in Prague, both UberPOP, and UberBLACK. We personally use Uber cars many times a week and have never encountered any incidents. Also, there haven’t been any incidents since Uber began offering services in Prague almost three years ago. In case you’ve never used Uber before, use our invitation to get your first ride for free. This is limited to 100 CZK ($5.00). 7. Are There any Alternatives to Uber in Prague? Yes, and actually quite a few. Here is our list sorted by recommendations. Probably the best one is Taxify which has the exact same concept and mobile application as Uber, but is even cheaper and sometimes they have more cars available. Their drivers are also more professional. Read more about Taxify. If you are looking for a transfer from/to the Prague Airport, the best way is to use a private pickup service by Welcome Pickups. It offers far better quality and reliability than Uber. For the same price as a regular taxi or Uber (22€), you will get a private driver with excellent English and knowledge of Prague. Liftago app is something like a Czech Uber, but the price is set by each driver, not the platform. So you simply enter locations for pick-up and destination, and then you can select from a list of drivers based on price and rating. Read more about Liftago. If you aren’t a fan of modern technologies and prefer an old-school taxi service, go with Modry Andel or Tick Tack. Both have luxurious cars, professional drivers and reasonable rates of 28 CZK per kilometer. Read more about taxi companies in Prague. Hello, I’m thinking to order Uber from Prague Airport to our hotel in the old town. My flight is arriving at 9:00-9:30am on a Sunday. is that consider rush hour? I have never used Uber before so I’m a little confused with the car options. we have a total of 2 people + 2 luggage, which car type should I choose for? Hello we are going to arrive to airport soon. We are four men with our luggages. Which kind of UBER do we have to take? 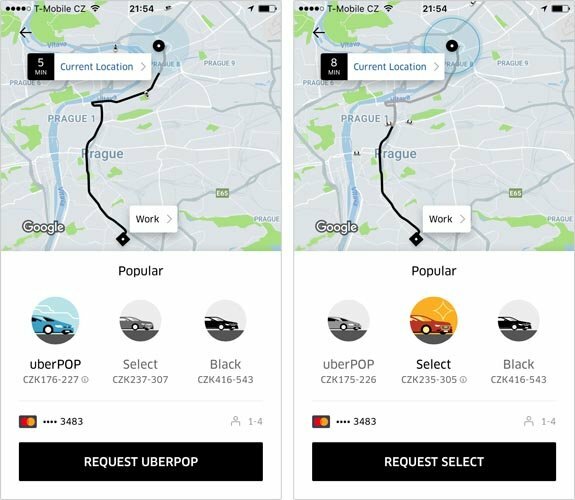 UberPOP, Select or black? You should be able to fit into any type. But Select and Black are typically more spacious.